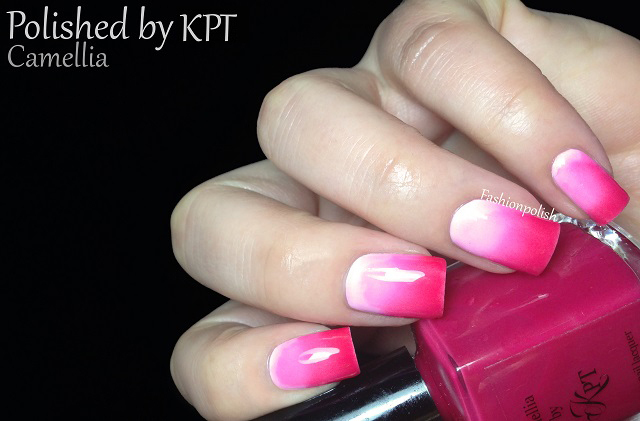 Fashion Polish: Introducing... Polished by KPT! How's your weekend so far? Mine has been kind of busy, I've spent most of my time swatching and I have a ton of pretties to share with you very soon! 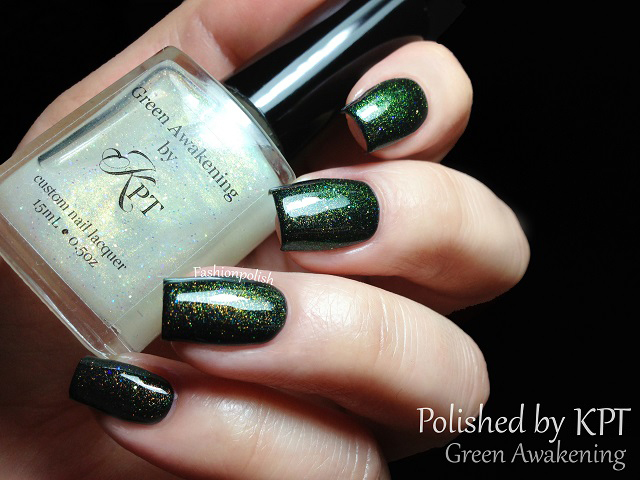 Green Awakening is a gorgeous clear based mix of color shifting shimmer, from hot orange-gold to green, as well as small iridescent blue glitters. It's super hot IRL, sparkly with a strong morphing effect, and I love how different it looks with the extra glitters. This is one coat of Green Awakening over black plus topcoat. Dream Lover is a tender white jelly with a mix of pastel glitters, including a few stars and hearts. I've grown to love white jelly glitters and this one's really pretty, so soft and delicate! Formula was surprisingly nice and I managed to achieve full coverage and decent glitter payoff with 3 thin coats. No fishing for the larger pieces in the swatch below. 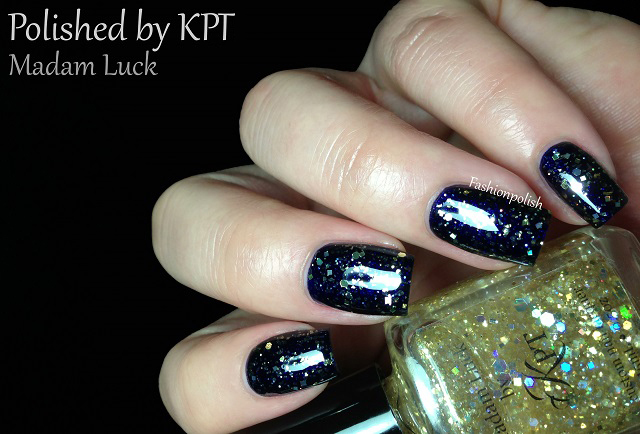 Madam Luck is a heavy mix of gold glitters in various shapes, sizes and finishes. It's really packed with glitters and sparkles like crazy! I used one coat over Pretty Serious Hot Summer Nights plus topcoat here. Next : the thermals : fading from their original color (cold or room temperature) to clear (hot). Formula and effect were very similar on all three shades so I'll just talk about them here. I used one coat of each over white to offer a consistent review but the possibilities are endless. Formula was great on all of them and they applied like a dream. The thermal effect was also really amazing, very noticeable and reacting almost instantly to temperature change. 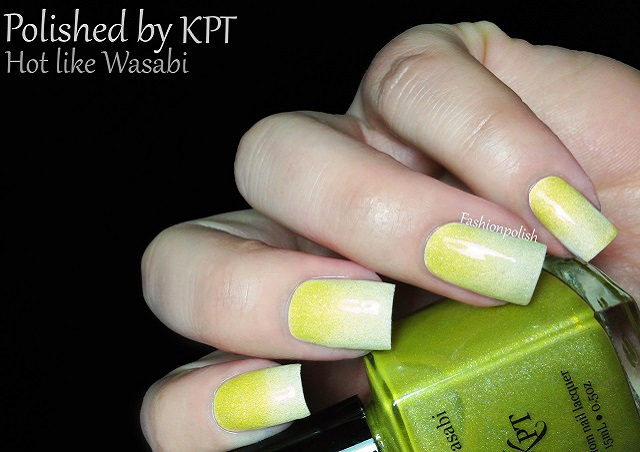 Hot Like Wasabi is a murky greenish yellow with scattered holo particles. It appears more yellow on my nails than in the bottle because of the white base but it's a very versatile color so more coats or a different layering choice would result in a completely different look. Kelvin Bleu is a periwinkle-blurple jelly, also with scattered holo particles. The "cold" color is really beautiful! 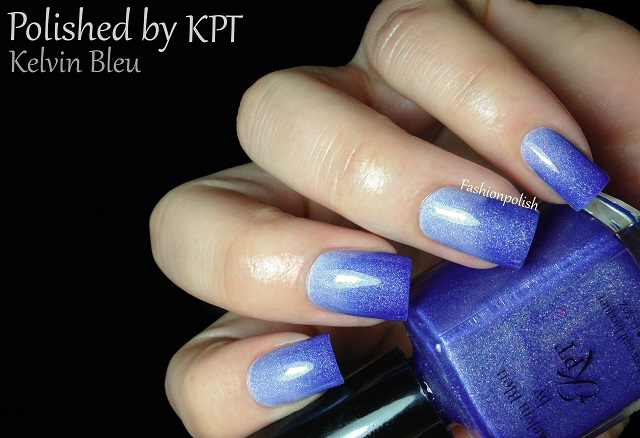 Kelvin Bleu is one of Polished by KPT's hot shades and I can easily understand why! 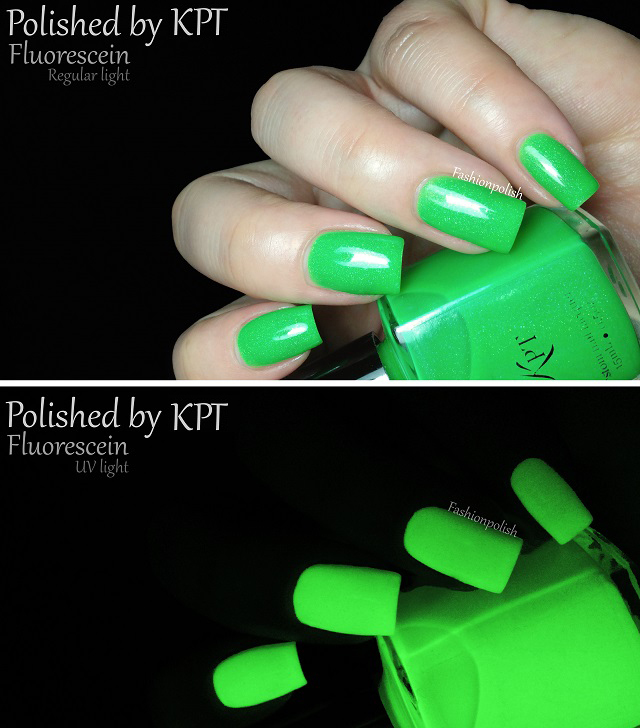 Fluorescein is a neon green jelly with scattered holo and UV light reacting particles. Under regular lighting, it basically looks like your average neon green (with holo!) but under UV light it just glows like crazy! No matter how hard I tried I couldn't color correct the UV version so please imagine it as bold but the exact same color as under regular lighting, i.e. not more yellow as the swatch below shows. I used 3 thin coats plus topcoat here and and no undies. After trying these seven shades, I can easily understand the hype around Polished by KPT. 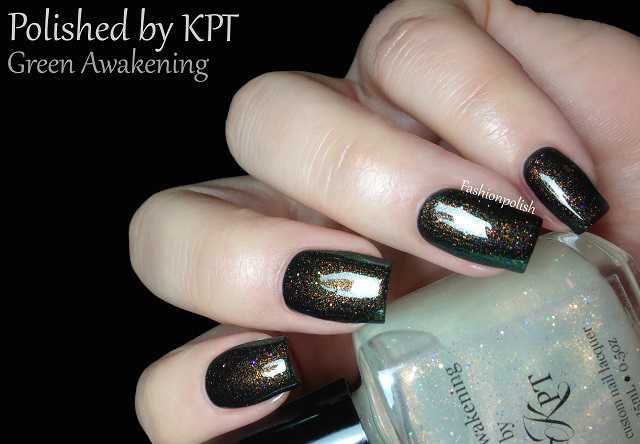 The glitters are well balanced and the thermal and UV shades beautiful and a lot of fun. Polished by KPT is available for purchase on the brand's website (US & Canada shipping) and Shoppe Eclecticco (worlwide shipping). Prices vary from $9 to $12. IKR? I LOVE it too! Your blog is addictive! I love the reviews and care you take with the pics! Just bought Green Awakening and Spectaflair-so pretty. Now I have to guard my wallet when I read you! (Just teasing) Wish there was a place to say who recommended their polishes, I bet your posts boosted both web traffic and sales. Have a wonderful week! Out of all the nail blogs I read, your are the most beautiful swatches. These are in my *to swatch* pile and I can't wait to get them all on my nails and play with them. You made them all look stunning as usual!! LOVE these polishes! I bought Green Awakening and Spectraflair! Can't decide which I'm going to put on tonight. Thank you so much for sharing these with us!